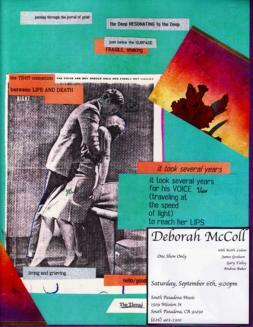 Deborah McColl had an established career as a solo singer/songwriter on the East Coast before relocating to the Los Angeles area nearly two decades ago. In some circles, however, she is still best known as the original “Reeferette” in Jimmy Buffett’s Coral Reefer Band. From 1978 to 1982 - the period that harmonica player Fingers Taylor refers to as the “heavy artillery days” - she toured with Buffett, recording six albums and co-writing two songs. But McColl’s solo work is not about Margaritas or wasting away. Her songs are fresh and inspiring - some are country/folk with a twist of bluegrass, others poetic and moody, but all have a modern edge. Her concerts, as well as her CD, feature her exquisitely pure vocals and the super-sweet acoustic guitar playing of Patrick Lubow. Interestingly, McColl’s ‘day job’ provides both contrast and complement to her musical endeavors. In the mid-80’s, to counterbalance the brain-draining rigors of ‘the road’, she returned to school and earned her graduate degree in clinical psychology. A licensed psychotherapist since 1992, she specializes in working with artists and musicians deborahmccollmfcc.com. Her weekly Creative Process Group, held at her office in South Pasadena, supports and inspires participants’ creative integrity in a hectic, profit-oriented world. After listening to this solo debut from L.A.-based songwriter Deborah McColl, one’s reaction is likely to be, “Why did she wait so long?” A 20-year-plus veteran in the music industry, McColl has shared the stage with the likes of Tom Waits, Cat Stevens, and Hoyt Axton. Moreover, between 1978 and 1982 she sang backup and recorded with Jimmy Buffett (with whom she continues to maintain a strong connection).